Before the words, “Would you like to take a Triumph Thruxton R for a ride?” even fully registered in my brain, I was reaching for the keys and heading toward the parking lot. I wonder how far I could make it before the police caught up with me and made me return it? Let me back up for a second. To be clear, I showed up in Atlanta to pick up Triumph’s new Street Twin, not the Thruxton R. My plan was to ride the Street Twin down to Circuit of the Americas in Austin, Texas, for MotoGP weekend to get in some solid seat time before shooting a full video bike review. As I walked across the parking lot of Triumph’s corporate offices, Garrett Carter, Triumph’s PR guy, motioned to two shiny, new Thruxton Rs sitting in the lot. Do I want to ride it? Wait, is that a real question? RevZilla photo. Let me tell you folks that Mama Dunbar raised me right. I wouldn’t dare insult the good people of Triumph by declining such an offer. Hence, I spent the following hour riding around the outskirts of Atlanta on a brand-new Thruxton R. Dinner could wait. The fact that this bike shares nothing in common with the previous version was immediately evident. Sitting at a stoplight, I could hear the fan on the radiator kick on as the new 1200 cc liquid-cooled engine warmed up. It sounded foreign on a Triumph Modern Classic, but there was a payoff. The new engine has been designed to give riders plenty of real-world, usable power. RevZilla photo. The new 270-degree crankshaft seemed to skip a heartbeat compared to the old 360 crank. Sitting still it almost felt… lazy. This notion was quickly dispelled with a tug of the throttle, which delivered breakneck thrust compared to the old engine. The new Thruxton is a torque monster. Triumph claims 62 percent more torque and 41 percent more horsepower than the previous Thruxton with the 865 cc engine. I believe it. This thing pulls like freight train compared to the previous generation. Throttle response felt a bit vague with a bit of on/off abruptness. Triumph includes three rider modes with the Thruxton, Rain, Road, and Sport, and I spent the majority of my limited time in Sport mode. With more time, I would be curious to see how Rain and Road mode perform. But my initial impression is that I would like to see a bit more immediacy spread throughout the full range of throttle motion in the Sport mode. The new Thruxton also gets ABS and traction control, both of which can be disabled. While I didn’t play around with turning these off, I did come to a few aggressively abrupt stops and was pleased with the overall feel of the ABS. It worked well to slow the bike down without unsettling the rider. Updated gauges include a gear indicator, throttle modes indicator, and a cleaner look. RevZilla photo. The redline has been lowered to 7,000 rpm on the bigger engine but it provides more power everywhere you want it. Instead of focusing on top-end horsepower, the Thruxton’s power feels strong all through the rev range. Because of this, it is very forgiving about gear selection. I was blasting around, riding way too fast, not focusing on correct gear placement, and the Thruxton accommodated my every errant shift. Shifts were silky smooth with a tight, clear feel. The gearbox felt extremely refined. I didn’t get to spend much time cruising down the highway, so I can’t speak much to the addition of a sixth gear. I can tell you I didn’t find myself searching for a non-existent additional gear at 70 mph, a first for me on a Bonneville-based bike. The bike in general just feels tight. It felt glued to the road. While I am sure the Pirelli Diablo Rosso Corsa tires had a hand in this (remember, Triumph updated the Thruxton’s rims to 17 inches to accommodate real sport rubber better than the old 18-inch wheels), the upgraded suspension was the star of the show. The "R" gets an upgraded suspension. RevZilla photo. Bumping to the “R” version gets you an upgraded, fully adjustable Showa “Big Piston” fork and Ohlins shocks out back. You also get massive Brembo brakes up front. The brakes felt a bit spongy. Their initial bite was not as crisp as I expected. I didn’t have the opportunity to make adjustments to the lever and I am curious as to whether that would help with overall feel. Even the key gets an update. RevZilla photo. The overall fit and finish on this bike shines through. These are the first factory mirrors on one of Triumph’s Modern Classics that I would keep if this bike were mine. I like Triumph’s redesign of the “Amal” fuel injector bodies. Hell, even the ignition key got an update. The new bike has a very unique calmness to it. The power feels big and fat and comes on with a silky touch. Ergonomics were far better than I expected. I was much more comfortable on this bike than the previous version, something I wouldn’t have guessed with the revised clip-on bars and rear-set footpegs. 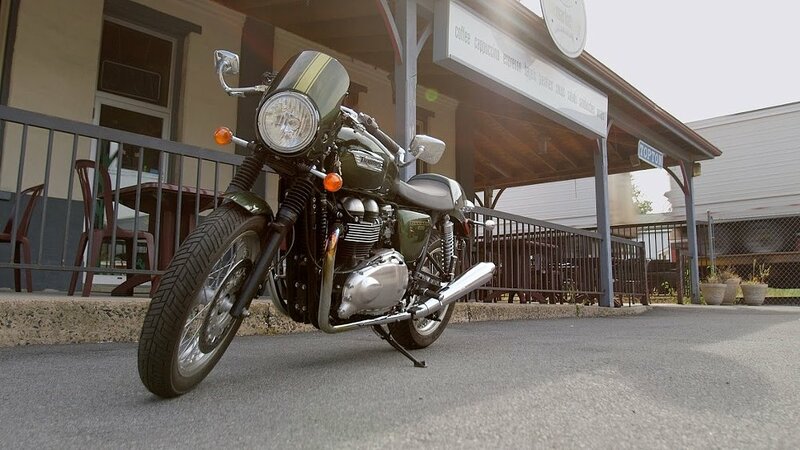 While I only had a sparse handful of miles with the new Thruxton, it left me wanting more. But more would have to wait. While Garrett assured me that we would be able to get more time with the Thruxton for a proper review, my thoughts were already drifting back to the real reason I had come to Atlanta. The new Triumph Bonneville Street Twin. Spending an hour with the hottest new bike in town is great, but getting to spend days on the road with virtually any bike will trump it every time. I smiled as I strapped my old Cortech luggage to the back of the Street Twin in the setting Georgia sunlight. With my tent and sleeping bag secured to the rear seat, and three days to tackle a thousand miles, I set off to ride the long way to Texas.